Anna’s Orange Flavoured Thins from Ikea, in their box. Another trip to Ikea means another trip to the Ikea food store. Hurrah! 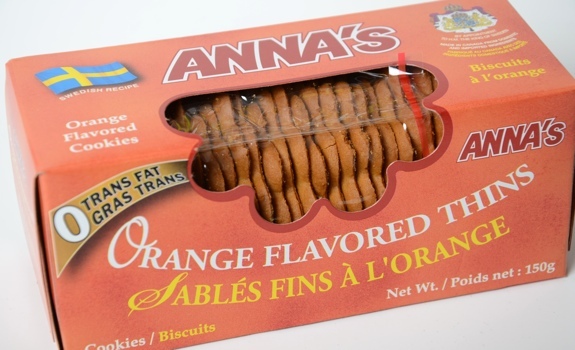 This time, I spotted some super-cheap Anna’s orange flavoured thins in a box. It’s like I can never leave Ikea without buying something. The Pitch: “Swedish recipe.” Also, “By appointment to H.M. the King of Sweden.” An interesting blurb on the back of the box talks about Sweden’s love of gingerbread cookies, and how Anna Karlsson started baking this particular cookie recipe in 1929. Eating gingerbread, the box says, is supposed to make a person feel happy. Since I’m a cheery fellow by nature, it shouldn’t be hard to boost my mood with gingerbread. The Look: Orange-pink box with a Swedish flag and royal crest, as well as a cut-out window in the cardboard that shows the plastic-wrapped bag of cookies inside. 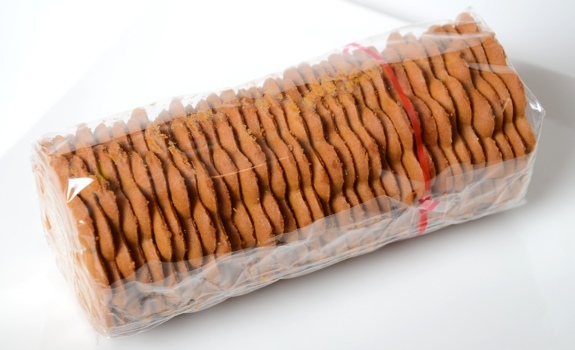 The cookies themselves look thin and crisp, more like crackers or particularly svelte digestives. After opening, the plastic wrapper is highly impractical, as it doesn’t neatly close up again. 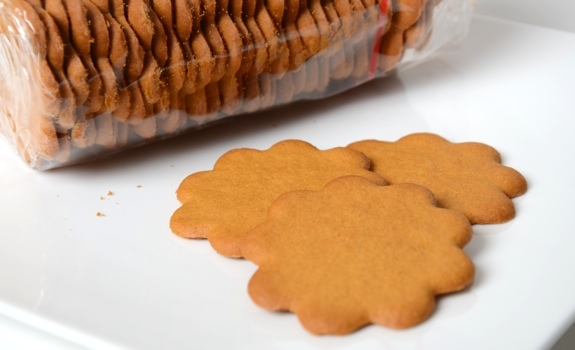 The Taste: The aromas of both orange and gingerbread are obvious as soon as the package is opened. The cookies are crisp, with a well-baked flavour that treats the orange and gingerbread as a marriage of equals. The orange flavour is strong and natural, like orange zest instead of juice. The gingerbread is gingerbready (how else am I going to describe it?). The texture is crunchy and a bit sandy. They’re nice, but I wouldn’t be able to eat many in a sitting – the flavour is intense, and I was ready to stash them back in the pantry after around eight to 10 cookies. Anna's Thins are thin and crispy, a cookie on the verge of stepping on cracker toes. Cost: $1.29 for a 150 gram box. Value for cash money: Ridiculously good. Nutrition? : Per 6 cookies (28 grams): 130 calories, 5 grams of fat, 140 mg of sodium, 0 grams of fibre, 1 gram of protein. The verdict: Good, but I really wanted water after eating a few cookies. They’re dry, and I can only take so many of them. The orange flavour builds, much like hot peppers pile layers of heat on one’s tongue. A nice snack here or there, but don’t overdo it in a single sitting. Anna’s Orange Flavoured Thins in their impractical plastic wrapper that opens midway in the package. I was thinking of these delicious crisps recently and Googling to find them. They don’t appear on Ikea’s web site now and I didn’t see them when I was in the Burbank, CA Ikea last week. Are they still in your local Ikea store? So sad if they’re no longer stocked by Ikea; fortunately they’re still available through Amazon and elsewhere online (but at higher prices). Hmmm. I didn’t check during my last visit to Ikea, but I’ll try to remember on my next visit. The food store seems to have a seasonal selection of things that come and go throughout the year, as well as some stuff that’s always available. Maybe the Anna’s cookies fall into the seasonal category?